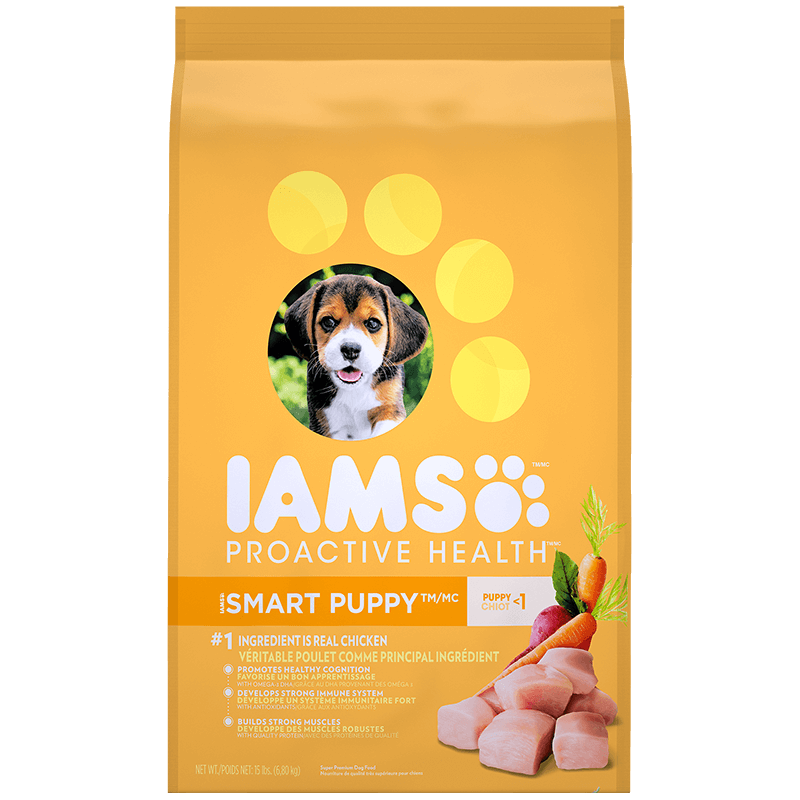 IAMS Smart Puppy raises your pup’s training potential with essential DHA for strong brain development, making his year of firsts a happy one. Chicken, Corn Meal, Chicken By-Product Meal, Ground Whole Grain Sorghum, Dried Beet Pulp, Chicken Flavor, Chicken Fat (preserved with mixed Tocopherols, a source of Vitamin E), Chicken Meal, Fish Oil (preserved with mixed Tocopherols, a source of Vitamin E), Dried Egg Product, Potassium Chloride, Brewers Dried Yeast, Salt, Choline Chloride, Fructooligosaccharides, Minerals (Ferrous Sulfate, Zinc Oxide, Manganese Sulfate, Copper Sulfate, Manganous Oxide, Potassium Iodide), Calcium Carbonate, Vitamins (Vitamin E Supplement, Ascorbic Acid, Vitamin A Acetate, Calcium Pantothenate, Biotin, Thiamine Mononitrate (source of vitamin B1), Vitamin B12 Supplement, Niacin, Riboflavin Supplement (source of vitamin B2), Inositol, Pyridoxine Hydrochloride (source of vitamin B6), Vitamin D3 Supplement, Folic Acid), DL-Methionine, L-Lysine Monohydrochloride, Rosemary Extract. 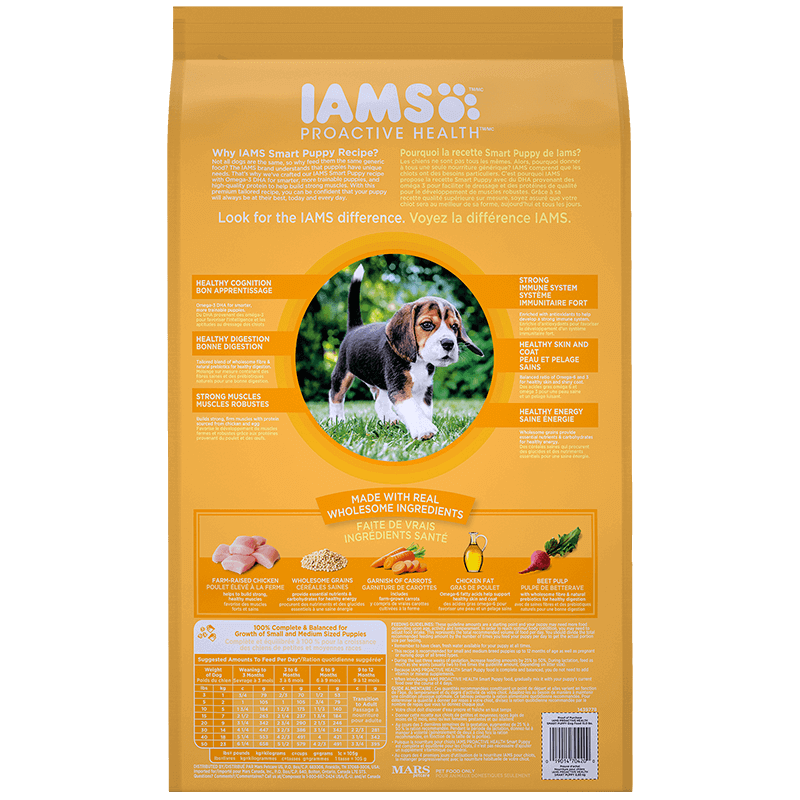 During the last three weeks of gestation, increase feeding amounts by 25% to 50%. During lactation, feed as much as she wants (usually two to five times the guideline amount, depending on litter size). 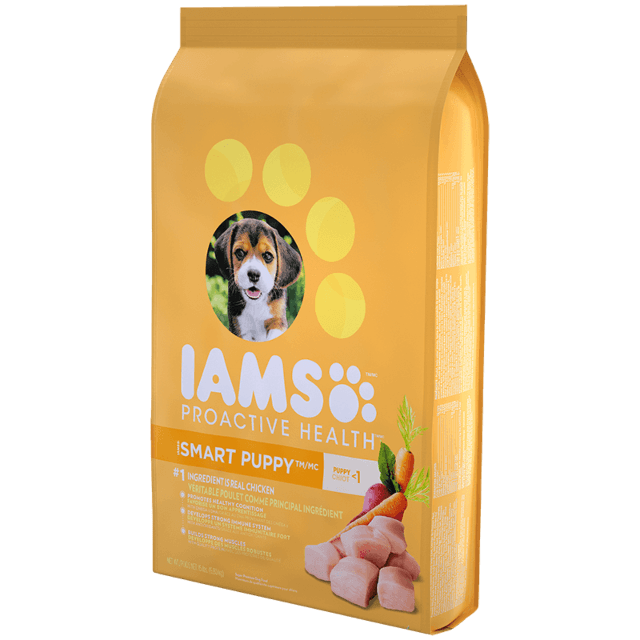 Because IAMS ProActive Health Smart Puppy food is complete and balanced, you do not need to add vitamin or mineral supplements.